Download "Answer: C. The strength of a correlation does not change if units change by a linear transformation such as: Fahrenheit = 32 + (5/9) * Centigrade"
1 Statistics Quiz Correlation and Regression -- ANSWERS 1. Temperature and air pollution are known to be correlated. We collect data from two laboratories, in Boston and Montreal. Boston makes their measurements of temperature in Fahrenheit, and Montreal in degrees centigrade. Boston measures pollution in particles per cubic yard of air; Montreal uses cubic meters. Both report a correlation of exactly 0.58 between temperature and pollution. Which of the following is true: A. Boston really has the higher correlation, because Fahrenheit temperatures are higher than Centigrade. B. Montreal really has the higher correlation, because cubic meters are bigger than cubic yards. C. Both cities have the same correlation, because correlation is independent of the units of measurement. D. We do not know which city has the really higher correlation. Answer: C. The strength of a correlation does not change if units change by a linear transformation such as: Fahrenheit = 32 + (5/9) * Centigrade 2. Which of the following is NOT a possible value of the correlation coefficient? A. negative 0.9 B. zero C. positive 0.15 D. positive 1.5 E. negative.05 Answer: D. Correlations are always between -1 (perfect negative) and +1 (perfect positive) 3. We measure heights and weights of 100 twenty-year old male college students. Which will have the higher correlation: A. corr(height, weight) will be much greater than corr(weight, height) B. corr(weight, height) will be much greater than corr(height, weight) C. Both will have the same correlation. D. Both will be about the same, but corr(weight, height) will be a little higher. E. Both will be about the same, but corr(height, weight) will be a little higher. Answer: C. Correlation is independent of the order in which the variables enter. 4. Two lists of numbers, X and Y, have a correlation of 0.3; X and Z have a correlation of We know that: A. the stronger correlation is the correlation of X and Y, since it is positive. B. the stronger correlation is the correlation of X and Z. C. the two correlations are equally strong, since = 0.3 D. We cannot tell which is stronger without more information. Answer: B. The stronger correlation is determined by the absolute value, since it measures the scatter of points about a line. Whether the line has a positive or negative slope, the less the scatter, the greater the absolute value of the correlation. 5. Suppose men always married women who were 10 percent shorter than they were. The correlation coefficient of the heights of married couples would be: A if the correlation were computed with corr(male.height, female.height) B if the correlation were computed with corr(female.height, male.height) C no matter which way the correlation were computed. D. 1.0 since the height of the man is always predictable from the height of the woman. Answer: D. All points in a graph of the correlation would line on the straight line Hf = 0.9 * Hm where Hf = female height and Hm = male height. 3 10. The correlation between the ages of the husbands and wives in the United States was which of the following? A B C. zero D E Answer: B. Men usually marry women of about their own age, but of course there are enough exceptions that the correlation is not perfect. 11. A study is done of the impact of a drug on body temperature and blood pressure. We have three observations: Temperature(F) Pressure (mg) Temp - 97 Pressure The correlation coefficient is closest to A B C D. zero E Hint: a good guess is possible by plotting the data carefully. a better one is possible by subtracting the lowest number in each list from all the other numbers in that list. Answer: A. Transform the first column of data by subtracting 97 from each number; transform the other column by subtracting 80 from each. The result is given above; the line Pressure = 10*Temp holds perfectly for all points. 12. The correlation between the average midterm score of each of 10 classes of statistics and the average final exam score was found to be A statistics instructor concludes that if a student has a B on the midterm, he has an 85 percent chance of a B on the final. 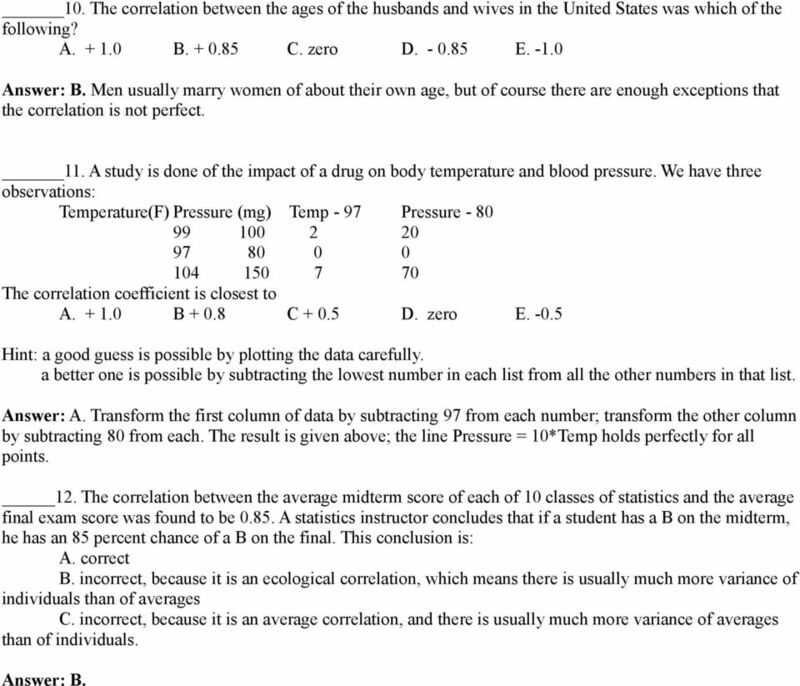 This conclusion is: A. correct B. incorrect, because it is an ecological correlation, which means there is usually much more variance of individuals than of averages C. incorrect, because it is an average correlation, and there is usually much more variance of averages than of individuals. Answer: B. 5 20. We plot the data lying behind the question 13 regression with the R command >>> Plot(SAT-Math, GPA) To draw a regression line on the plot, use the R command: A. >>> abline(0.36) B. >>> abline(20, 0.1) C. >>> abline (0.3, 5.0) D. >>> abline (0.1, 5.0) E. We cannot draw a regression line because we do not know the correlation coefficient. Answer: B 21. The regression line is drawn so that: A. The line goes through more points than any other possible line, straight or curved B. The line goes through more points than any other possible straight line. C. The same number of points are below and above the regression line. D. The sum of the absolute errors is as small as possible. E. The sum of the squared errors is as small as possible. Answer: E 22. In a regression, the --- that the standard error of the regression is, the greater the accuracy of the prediction will be. A. smaller. 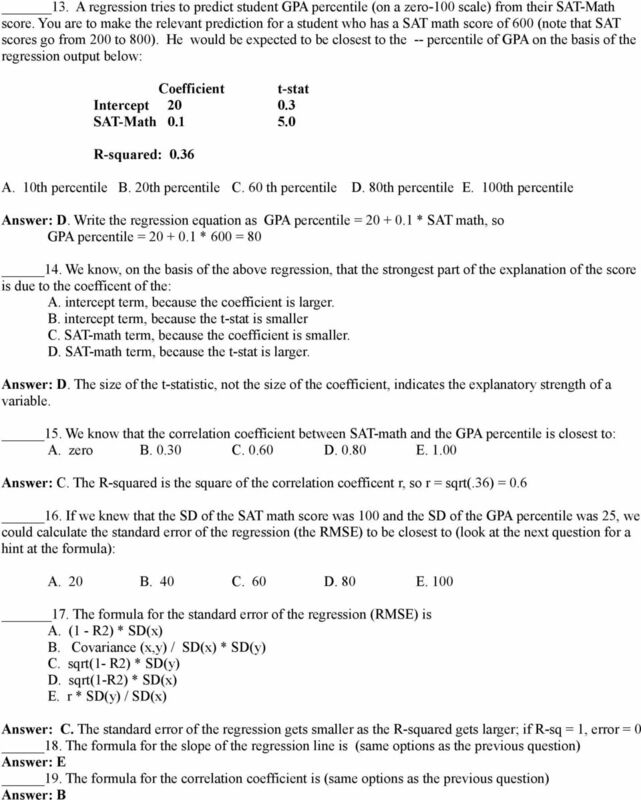 B. larger C. we do not know unless we know whether the slope of the regression is positive or negative. Answer: A. 23. In order for the regression technique to give the best and minimum variance prediction, all the following conditions must be met, EXCEPT for: A. The relation is linear. B. We have not omitted any significant variable. C. Both the X and Y variables (the predictors and the response) are normally distributed. D. The residuals (errors) are normally distributed. E. The variance around the regression line is about the same for all values of the predictor. Answer: C 24. 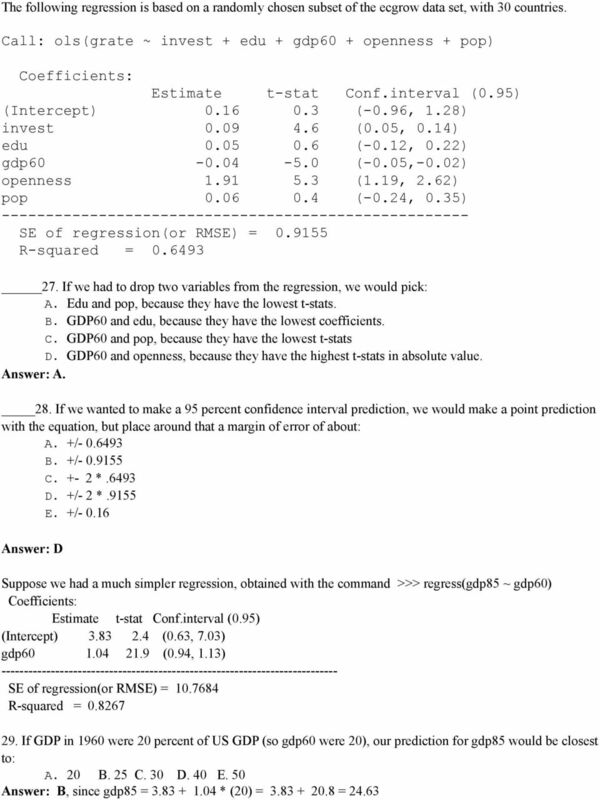 Note that the last question said that all the conditions are needed for a best and minimum variance prediction. Very few real regressions can meet all the criteria, but their predictions may still be quite good -- at least unbiased, though not perhaps minimum variance. The cases in which the predictions will almost certainly be biased are: A. conditions A and B are not met. In case C, there is no problem, so regression will give the best and minimum variance prediction. In cases D and E, regression will not give the minimum variance prediction. 25. Ecological correlations are weaker than other types of correlation because: C. They are based on averages rather than individuals 26. If a regression has the problem of heteroscedasticity, A. The predictions it makes will be wrong on average. B. The predictions it makes will be correct on average, but we will not be certain of the RMSE C. It will also have the problem of an omitted variable or variables. D. It will also be based on a non-linear equation. Answer: B. Heteroscedasticity implies that the variance will differ for different values of the regressor. How strong is a linear relationship? Mind on Statistics Chapter 3 Section 3.1 1. Which one of the following is not appropriate for studying the relationship between two quantitative variables? A. Scatterplot B. Bar chart C. Correlation D.
Several scatterplots are given with calculated correlations. Which is which? 4) 1) 2) 3) 4) a) , b) , c) 0.002, d) 0. Name Date Worksheet A5: Slope Intercept Form Find the Slope of each line below 1 3 Y - - - - - - - - - - Graph the lines containing the point below, then find their slopes from counting on the graph!. Chapter 8. Linear Regression. Copyright 2012, 2008, 2005 Pearson Education, Inc.
1. Suppose that a score on a final exam depends upon attendance and unobserved factors that affect exam performance (such as student ability). Individuals: The objects that are described by a set of data. They may be people, animals, things, etc. (Also referred to as Cases or Records) Variables: The characteristics recorded about each individual. Introduction to Regression Dr. Tom Pierce Radford University In the chapter on correlational techniques we focused on the Pearson R as a tool for learning about the relationship between two variables. Math 17, Section 2 Spring 2011 Homework 8 Solutions Assignment Chapter 7: 7.36, 7.40 Chapter 8: 8.14, 8.16, 8.28, 8.36 (a-d), 8.38, 8.62 Chapter 9: 9.4, 9.14 Chapter 7 7.36] a) A scatterplot is given below. Chapter 7 9 Review. Select the letter that corresponds to the best answer. table to see that the probability is 0.8413. (b) What is the probability that x is between 16 and 60? The z-scores for 16 and 60 are: 60 38 = 1. THE CORRELATION COEFFICIENT 1 More Statistical Notation Correlational analysis requires scores from two variables. X stands for the scores on one variable and Y stands for the scores on the other variable.